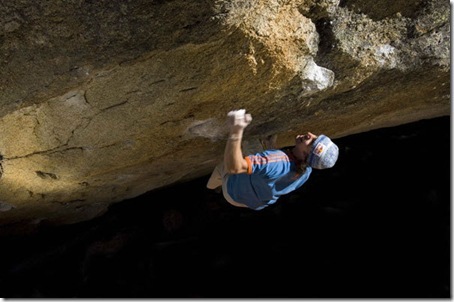 Ryan Olson has a very large gallery of images now up from his recent month in Hueco. Included are some pictures of Paul Robinson on Nagual. I speculated earlier this month that there might be some footage of Dave Graham’s recent visit to Arkansas and the footage has now surfaced thanks of course to Chad Greedy. 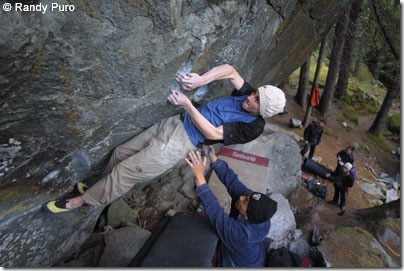 You can see Dave doing the FA of Southern Lean (V12) among other problems in the MVM premium area. A few weeks ago there was a competition held at the Boat Rock are in Georgia. Click here for results and more information. Wade David recently updated his Movies page. Some of the cooler new videos feature Jeff Sillcox on the FA of Mandala Direct (V12) and footage from the recent “Gun Show” comp at The Spot in Boulder. Daniel Woods has done a 1 day repeat of Bernd Zangerl’s New Base Line at Averstal, Magic Wood, Switzerland. Originally graded hard V15, Daniel felt it to be V14, and Dave Graham comments on his spraysheet that to him it seemed “normal 8b+ [v14]”. This is the problem’s 6th, and fastest, ascent after Zangerl, Fred Nicole, Dave Graham, Franz Widmer and Christian Core. This still leaves Graham’s two proposed V15s in Switzerland Story of Two Worlds and From Dirt Grows Flowers unrepeated and in need of Mr. Woods’s attention. …I’m simply fascinated by really difficult single moves. On a 20 move Font 8c I can usually immediatly do all the moves, so it’s just a question of stamina… and this motivates me less at the moment. I like trying things where in the beginning you don’t even know if it’s physically possible. Don’t forget about the MVM Subscription contest going on now. Just leave a comment on the post and you are in the running for 1 month of free videos! 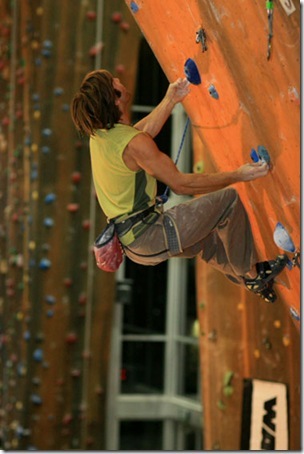 Have local climbing news you’d like to share, send it via the Contact Page! Always enjoy your site. Thanks for posting the video hope you enjoyed it. Hayden did make a first repeat of Dave’s Daddy Fat Sack V11/12 unconfirmed at ute pass but my batteries died and I was unable to capture the send. Only a hand full of people have climbed the Bloody Arete Sit Start and it is definitly one of the better line at the pass and concenious seems to be around solid v10. Anyways Hayden is all juiced up fro more pass action so stay tuned for more video. If you want to see all my vids search sococlimber1 on youtube. Halla at ya later and keep up the good posts. Bryan aka Byron aka Tojo! hayden’s got a promising 2008 brewing for sure. fortunately, i can still take him if i keeps the element of surprise.